William John Walker was born at Surry Hills on 13 June 1874, the son of William Walker and his wife Margaret Sarah, nee Lees. In 1894 he married Edith Adelaide (1876-1948), the daughter of James and Mary Greenaway. They had four daughters. He died on 31 July 1942 at Ashfield, aged 68, and was buried in the Presbyterian section of Rookwood Cemetery. Walker was educated privately at Christ Church St Laurence and Crown Streets schools. He worked in the office of the Evening News before joining the Metropolitan Water and Sewerage Board and becoming qualified as an accountant. From 1902 to 1904 he was honorary secretary of the Board’s branch of the Public Service Association. Walker was initiated into the Sons of Temperance Order friendly benefit society in 1888. He held various offices until he became General Secretary in June 1904. He was prominent in the campaign for early closing of hotels. In 1919 he was living at Stanmore. 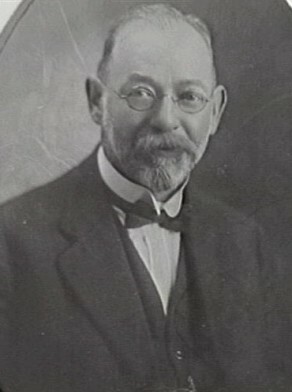 Walker was president of the Sydney United Friendly Societies Dispensary in 1908 and President of the Friendly Societies Association of NSW from 1909 to 1910. He was elected life governor of the Benevolent Society of NSW in 1905 and also of the Royal Prince Alfred Hospital. He was a member and president of St Margaret’s Hospital committee. He was connected with the St Andrews Cathedral Young Men’s Institute and Debating Society, being a council member and organiser of several charitable events.Walkerwas an office–bearer of the Crown Street School Old Boys Union. William Walker was Alderman for Flinders Ward, 1 December 1909 to 30 November 1924. He was a member of the Finance Committee, 1910-12, 1914-19, 1920-24 and its Vice-Chairman in 1917, 1920 and 1924. He was a member of the Works Committee, 1910-13 and 1919-23, the Queen Victoria Market Building Special Committee, 1910-11, the Health and By-Laws Committee, 1911-16, the Electric Lighting Committee, 1914-18, and the Electricity Supply Committee in 1924.